Platform shoes are always known for being great party shoes. Here at IKRUSH we have a great selection of beaut platform shoes for you to pick from! We are obsessed with so many different styles when it comes to the platform. We have fluffy detailing, studded detailing and even lace up finishes and we love them all equally as much! We love how platform shoes look great as well as being much more bearable to wear than stilettos. You gain the extra height and look more glam for a more comfortable style of shoe. What more could you want?? Every season we bring in new styles of platform shoes that are driven by the current trends of that season. At the moment, we are loving all of the bright and pastel coloured heels we are stocking in time for those warmer summer months - they add a pop of colour and can really make your outfit stand out so much more. We have a few styles of platform shoes for you to choose from depending on the occasion or event. 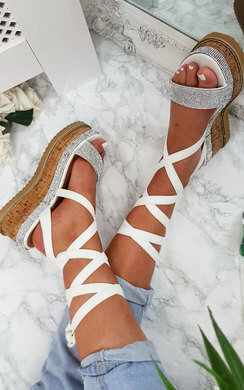 The platform heels are the most obvious ones and the great thing about them is that they are such a great style of shoe to wear for parties, dinners and generally if you are wanting to dress up and feel fabulous. 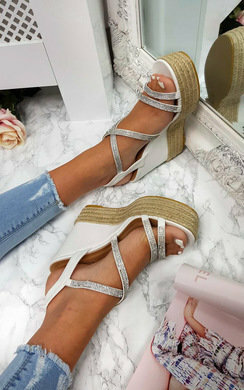 We also have platform style wedges - these make more of an appearance in summer and we love them paired with cute summer day dresses. We also have the platform style sandal - also known as the flatform. This is a huge trend right now so you better be quick and snap up a pair in time for this season! Make sure and head over to our dresses and clothing pages next so you can style your new shoes with a killer outfit to be the best dressed this season!